Consumers Energy Company D.E. Karn Plant | North American Dismantling Corp. This project consisted of removing Units 1 & 2 Primary and Secondary Precipitators, ID Fans and all inlet/outlet ductwork located at the D.E. Karn Plant, 2742 N. Weadock Hwy in Essexville, Michigan. The structures were multi leveled to a maximum height of 125’-0” above grade, totaling 120,000 sf and was constructed of structural steel framing, supporting various pieces of equipment, hoppers, penthouses and other miscellaneous materials. Wet fly ash collection systems including all piping, fittings, valves and pipeline components. D.E. Karn Units 1 and 2 each consisted of a pulverized coal, tangentially-fired, double furnace, single reheat, balanced draft steam generator. Each unit had a gross rating of 275.MW. 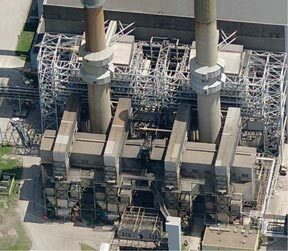 Unit 2 steam generator had low NOx burners that generated flue gas for the existing system. The flue gas for each unit had parallel flow paths that passed through selective catalytic reduction (SCR) system, regenerative air heaters, primary precipitators, secondary precipitators and ID fans before being discharged to the atmosphere through the chimney. Prior to NADC mobilizing onsite, Consumers Energy modified the existing system by installing new pulse jet fabric filter (PJFF) systems, new induced draft (ID) fans, dampers, ductwork, structural steel and all other associated equipment to control emissions and treat the flue gas generated by D.E. Karn Units 1 & 2. NADC subcontracted MPS to perform the environmental remediation of the bulk fly ash dust that was present inside the units. 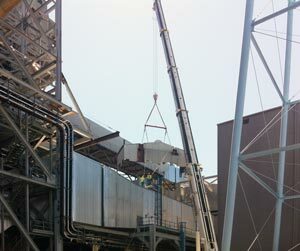 The ducts, precipitators and regenerative air heaters were power washed and vacuumed by MPS prior to NADC’s work. Storm sewers and catch basins located in the vicinity of the work area were covered with visqueen or filter fabric to prevent any accidental discharge into the storm system. Prior to performing any work, NADC secured the area with temporary 6’-0” chain link fencing with flagging on all gates. NADC conducted the demolition within the confines of the fenced area, including dismantling, material reduction, material staging, loading and truck staging. Absolutely no one was allowed to enter the demolition site without first obtaining permission from NADC.